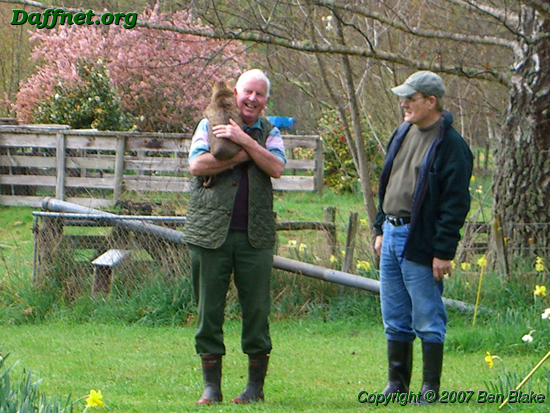 Nancy and I have lost a very dear daffodil friend today, Neil McQuarrie of New Zealand. Neil had such a positive and friendly attitude about life and I was always happy to see him and be around him. As Neil said “we are mates”. Neil enjoyed funny stories and had a wonderful laugh. Nancy and I always looked forward to a visit with the McQuarries. Today, our thoughts are with Denise and the McQuarrie family. Neil is on the left holding his cat. Neil was one of the kindest cheeriest people that you could wish to meet. He always had a smile on his face and encouraging words. Even in the face of adversity he retained his sense of humour. I spoke last to him on the morning of Ian and my wedding just over a month ago, his fondest wish then was that he could have attended the day and joined in the celebrations. 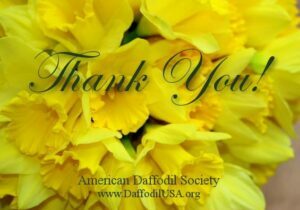 To Denise and family I am sure daffodil growers worldwide send there best wishes and love. We are a very close family when the chips are down. Daffodil shows in New Zealand will not be the same without him. Personally Ian and I have lost a great friend, we will miss him dearly. Vice President – National Daffodil Society of New Zealand. You must be logged in to enter a comment.